Affordable Accoutrements: THE FIND - a Blogoversary Gift for YOU! THE FIND - a Blogoversary Gift for YOU! It's difficult to believe that I've been blogging for almost a year. My first post went up on June 24, 2009. I've met wonderful people during this busy year, learned a great deal, shared ideas, and enjoyed a creative outlet like no other! To celebrate my first year of blogging, I'm hosting a giveaway. Actually, I've accepted a generous offer from Stan Williams, The Elegant Thrifter. 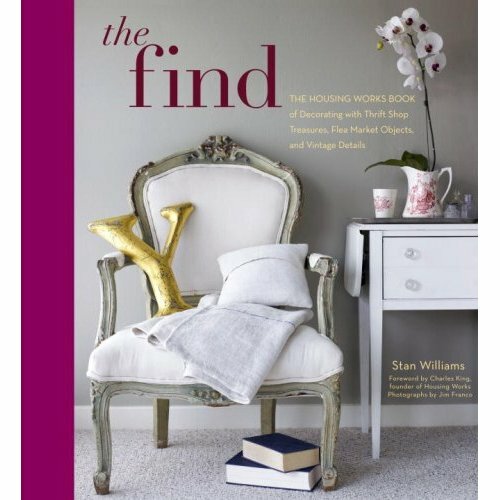 He's providing your gift: a copy of his book, The Find: The Housing Works Book of Decorating With Thrift Shop Treasures, Flea Market Objects, and Vintage Details. Among many other accolades Stan's book has received, Apartment Therapy Boston named The Find #1 on a list of the 5 best design books of 2009. Read it here. The closing Stan uses for every post he does is "Always Frugal, Always Fabulous," and that really sums up his approach to design ... and to life! Many of you know Stan already. He pops in on our blogs from time to time and often leaves generous comments. I'll admit now that I didn't quite realize at first that he's a BIG deal in the world of fashion and design. Before taking a sabbatical to work on his book, Stan was fashion director at Maxim for 7+ years, where he was in charge of men's fashion and grooming coverage at the largest men's general interest magazine in the country. Before joining Maxim, Stan worked at Fairchild Publications for nearly 10 years in several editorial capacities, lastly as features editor at DNR. (DNR is the menswear equivalent of Women's Wear Daily). 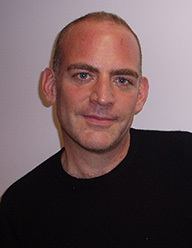 He has a journalism degree from University of Missouri-Columbia's journalism school and lives in New York City. His writing style is smart and witty, and his design sense is quirky, clever, and fun! If you do a quick Google search, you'll find Stan being quoted in articles in all sorts of publications, from fashion magazines and blogs to USA Today and The Washington Post. Sometimes you’re looking for it, sometimes it just finds you. Treasures of home décor abound at flea markets, thrift shops, and garage sales. But how do you know a find when you find it? In The Find, Stan Williams and some of today’s most clever style makers, including Simon Doonan, John Derian, and Real Simple’s Kristin van Ogtrop–all diehard devotees of New York City’s Housing Works–show not just what to look for, but also how to look at an object to identify a great piece. The trick is to see beyond nicks and wobbles, color and intended purpose and to focus on potential. For example, a vintage leather trunk encased in Lucite works as a stunning coffee table. Pages from old books wallpaper a foyer. A cushion fashioned from a baseball diamond’s home plate makes a garden chair comfortable. The Find includes chapters on furniture, accessories, small spaces, and entertaining. From a suburban ranch to an East Village studio in New York, each abode illustrates unexpected ways that secondhand items can make statements (or space) throughout a home. Elegantly photographed, filled with practical sidebars about refurbishing, styling, and treasure-hunting, and replete with the quirky sensibility that has made Housing Works one of the most popular destinations for great things, The Find is at once a handbook and inspiration for vintage decorating. Secondhand does not mean second rate when there’s always something special to be found. Stan called David Jiminez after seeing his house featured in House Beautiful when he was visiting family in Kansas City and found his email in the back of the book. His pal Ruth Handel looped him into Jonamor Decor, and Stan featured two of their interiors in the book. He knew there were people he wanted, like John Derian. He also called on his old friends from the fashion world whom he knew decorated with thrift and vintage: men's designer John Bartlett, GQ's creative director Jim Moore, and Mark Ciolli, principal of Carl and Co., a successful decorator. To get an idea of Stan's breezy writing style (and wicked sense of humor), check out his other blog, Hooch Bags by the Elegant Thrifter HERE. Vintage evening bags, funny money, (candy) smokes, a little nip here and there -- I'll let him tell you about it! OK, here's how the giveaway works. The winner's autographed and personalized copy of The Find will be shipped directly from Stan. You have through the end of the day on June 25th to enter. Nothing to buy! You don't even have to follow Affordable Accoutrements, subscribe, or have a blog of your own. Just leave a comment on Stan's June 16th post, HERE. Let him know you stopped by, OK? Come back and leave a quick comment for me on this post, making sure I have an e-mail address I can use to reach you when you win Stan's wonderful book! That's it -- a comment for Stan and one for me and you're IN the competition! Thank you for visiting and thank you for participating in the giveaway. What a great give away... I've followed your directions, but afraid their is a jinx when you are the first to post. Keeping my fingers crossed anyway. Would love to add this book to my stash! Love Stan's blog and yours!! Congrats on your One year Blog Anniversary. I would love a copy of Stan's book. Thanks for the chance Bill!! Love your new layout! Bill, I have been to Stan's, left a comment, and returned to leave one for you. Thanks for doing this, and thanks to Stan! I would love to win, and I also love the fact that I get to tell you who much I have enjoyed your blog ever since I discovered it which I think was about the time you started blogging. I wish you many more years of blogging fun for you and for us! Love you, you sweet man! Congratulations, Bill, on the up-coming one-year blog anniversary! I already have Stan's great book...the pages with the gorgeous dishes get thumbed through often! Congratulations on a year. I would have guessed many more years because your blog is so wonderful and professional. Bill, your blog is one of my favorites- your pictures always make me dream :) On my way to Stan's! Congrats on your Blogiversary! You are such an inspiration. Happy-almost-blogoversary! I have enjoyed your amazing tablescapes and especially your centerpieces made with flowers from your garden. Thanks for the tip about the book giveaway. I have a friend who would LOVE it, and I plan to give it to her when/if I win! Congratulations on your upcoming anniversary! It is hard to believe I have been typing posts for over 1 1/2 years now. Went over to visit Stan and left a comment. I bookmarked his blog, so that I can go back and visit when I have more time. Nice giveaway. Congratulations Bill. I always enjoy your tablescapes and your style is like no other. You have such a gift, from your flower arrangements to your silver & china, everything is just perfection. They leave me breathless. I did visit your friend Stan and would love to have his new book for my coffee table (and for more inspiration). Best wishes for another wonderful year of blogging. Congratulations, Bill, on your anniversary! And, thanks for the giveaway. Learning to see potential instead of flaws has been a goal of mine for a long time so Stan's book sounds intriguing; I've left him a note. I'm almost glad I didn't find your blog when you first began since I now enjoy going back and catching up as I find the time. You do a wonderful job as a blogger and I always look forward to your next post. Congrats, Bill on your one year anniversary. I must admit I have enjoyed all your posts! Count me in on the giveaway! Just left a post there! Here's to your 2nd anniversary! Dear Bill, happy almost anniversary. I thought you where much longer blogging. How amazing that you have just the 1st anniversary. Your blog is really wonderfull and I enjoy every post, you write, especially the tablescapes. I will give Stan a comment and hope, I have luck and will win this famous book. I would love to win your anniversary gift! I really love your blog and your tablescapes. Thanks for entering me and I'll keep my fingers crossed. Thank you and to all of your creative pals for all of the kind words and visits. I am in Kansas City spending time with my family, but I promise that when the winner is revealed and I get back home to New York, I'll ship a personalized copy out in the mail. And congratulation on a year in Blogland! I love your blog and what a wonderful book that Stan has written. Congrats on your 1 year! I would love to win because as I mentioned on Stans blog, my birthday is on June 25th and I am moving into a new apartment. Hi Bill~ ~ ~Thank you for the generous gift of Stans book. I'm sure its chocked full of great ideas. Congratulations friend on 1 year! Amazing how blogging can take you in different directions than you had ever thought. Its a fun ride. Oh I can't wait until I win! Ha! Seriously, congratulations on your anniversary! I'm so glad I found you, now that is winning! Looking forward to learning more about "The Find"
Hi Bill, Congrats on your 1 year anniversary. I have so enjoyed reading your blog and seeing all your beautiful table settings. Since following you I have pulled out my good crystal and china and started to use it again...even if it is a casual dinner for two. Thank you so much for all the inspiration and for this great giveaway. Just the cover alone makes me want a copy of this book. Can't wait to discover new ways to use garage sale finds. Congratulations on your one year blog anniversary!! I recently celebrated mine too. I was delighted to get this book from my daughter for Christmas last year. It is great! Hi, Bill! Happy Anniversary! Looking forward to many more of your posts and beautiful tablscapes. And I will visit Stan and leave a comment, because I am sure his book would be lovely to win! Here's my email if I get lucky enough to win. Thank you! Congratulations on your first anniversary!!! We started about the same time...and I remember you were one of my first followers. You have always inspired me in so many ways. Just this morning, I pulled your blue table post to share with my 91 yr old mother. She truly loved your floral arrangements (flowers are her thing. You have always had a kind word for each of us, encouraging each of us to continue stretching our creative selves. I look forward to another year (and more!) of your beautiful posts. Congrats and thanks for the awesome giveaway. I followed your directions, and I am crossing my fingers and my toes. Cannot wait for the upcoming year of tablescapes designed by YOU! Bill-Congratulations on 1 year! Keep up the good work. Went to Stan's and saw his amazing work, thanks for turning us on to him. And thanks for sharing with us! Linda (lmh_a@hotmail.com) NOT a blogger, but somewhere along the way I stumbled onto these nothing less then beautiful blogs . . . Yours being one of my favorites!! I think I found your link via Susan's between naps. Anyway, your blogs are wonderful to read, and even though I only discovered your recently I have clicked on each and every past blog you've done. Oh a PS of sorts . . . I am SO green with envey when it comes to all the treasures you have found in thrift stores and estate sales!!! Your posts are always enchanting. I love how you tell a story and make the reader feel they are right there, too. My blog theme is "Decorating with a Touch of the Past" and your beautiful tablescapes fit with what I love. You are always an inspiration. Congratulations on one year of blogging. Hi Bill, Congratulations on your blogoversary! The fact that you have developed such a large following in that short time period says a lot about your writing style and the content you deliver. You write in such a friendly conversational manner. When you leave a comment on my blog, you are so kind and I always come away with a smile on my face! Thanks for the chance to win the giveaway - appreciate it, Bill and you have a wonderful wknd! Bill, congratulations on your blog anniversary. You are one of my favorite stops in Blogville! Thanks for hosting on the veranda. I adore dining al fresco! Your little white blooms are beautiful. I would be happy for them to invade my garden. If you learn the name, let us know. As always the table setting fabulous and the photos stunningly beautiful. Bill conratus on your anniversary! I remember when I visited you almost a year ago that I've been following! Time flies! I love your dining table on the gorgeous porch. The setting is elegant and warm. Your home is so Southern Living!! Love it! Congrats again! Bill, another wonderful tablescape! I loved seeing your front por..uh..veranda! It is gorgeous! Only you would use a skirt and make the table that beautiful! If I did it everyone would ask why I threw my clothes on the table!!! Each Thursday I scroll through the posts until I find yours and view it first. You always do a beautiful and elegant tablescape. You are teaching me alot. Congrats on your blogiversary! I hope you continue blogging for many years to come. I would love to win a copy of Stan's book. Beautiful post! Pure eye candy! Loved watching the interview with Stan! Wonderful giveaway! Wow again! Each of your tablescapes are so beautiful that words can't do justice to them. I enjoyed my visit to Stan's blog and will visit again and look forward to finding his book in our local bookstore. Thank you and happy blog anniversary. ps I have sent you an e-mail with the info on the white flower. just stumbled upon your blog from stan's....love it! i left him a comment and now this one's for you. would love to win a copy of his fabulous book. i already have my library's copy and i don't want to give it back. Thanks for stopping by our blog. So nice to see you there. Your tablescape post gave me a chuckle as we have some very similar glassware -- your pink are my yellow. Congrats on your bloggaversary. Jane F.
Congratulations on your anniversary! I would love to win Stan's book and would certainly put it to good use! I LOVE your beautiful blog! Aren't blogiversaries nice? Thanks to you and Stan for the great giveaway, and here's to another year of posts! I've been following Stan for a while, glad he listed your link and thanks for the chance at the book! Just now finding you through Stan's site. I found The Find at the library, (go figure them having a current deco book) thought it was fantastic, then kept finding others praising the book. Usually it's the other way around. Would love to have a copy of my own, signed, oh my! Thanks for the opportunity, Susanne. Congratulations on your blogaversary! Yours is one of my favorite blogs to read. I would love to win Stan's book! I left him a comment and am following him. Congrats on your blogversary! I love your blog, so inspirational. And I have the wants for the pink glasses in your etsy shop. My friend, congratulations on your "One Year Blogaversary"! I would just like to say that I have thoroughly enjoyed all of your elegant and exquisite tables...simply divine! You certainly are a very creative and talented man! Sending you my very best wishes for another year of blogging success and blogging bliss, Bill!!! Also, thank you so much for doing this fabulous giveaway in celebration of your blogaversary! I would just adore Stan's book, "The Find"! I just visited his wonderful blog...introduced myself and left him a little note! Thank you again for providing many blissful hours through your delightful blog!!! Colors of the Sky -- for Your Table!